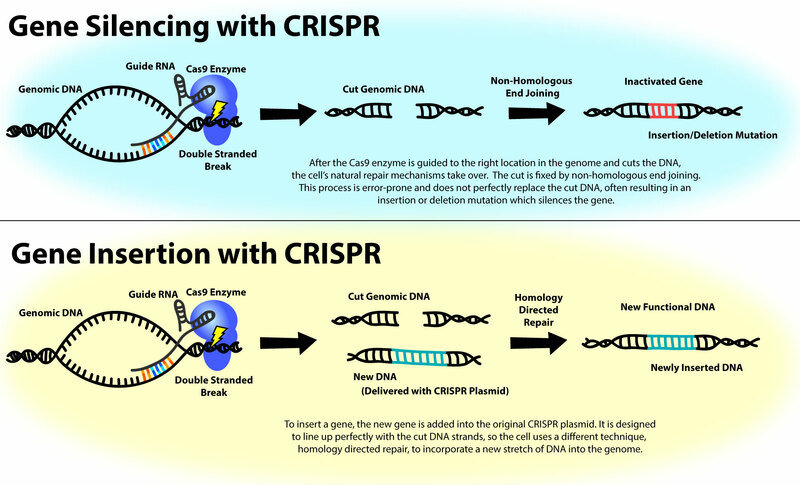 CRISPR is a method of genome editing in which select sequences can be targeted and removed, while select sequences can be added to the genome of interest as well. CRISPR actually functions by using a modified RNA-Enzyme complex, which bacteria originally used to deactivate viral DNA as a defense mechanism. The RNA in the complex contains a sequence complementary to the target sequence, and when the target sequence is identified the enzyme will selectively cut and disable the gene and/or add an edited sequence. The problem arrives when cells attempt to repair the double stranded break formed from the initial enzyme cut. Researchers at Novartis Institute noticed that when targeting specific sequences with CRISPR, many cells did not survive or were not viable. Researchers found that these DNA breaks are repaired by either non-homologous end joining (NHEJ) or homology directed repair (HDR). HDR is less likely to be used but much more efficient in that the correct sequences are added in the repair of DNA breaks. Non-homologous enjoining is hazardous because two incompatible regions of DNA are joined which may lead to dangerous mutations. Our cells have built in response systems to incorrect sequences by enabling regulators like p53. P53 recognizes such sequences and responds by either fixing the mutation, arresting the cell cycle or triggering apoptosis. Researchers thus tested CRISPR-edited cells for specific markers and observed an increase in marker expression associated with apoptosis and cell cycle arrest. Moving forward, It will be exciting to see how researchers combat this issue. P53 could possibly be silenced during procedure, but this may lead to other issues like an increase in cancer development. Another avenue would be to determine the best possible way for cells to utilize homology directed repairs over non-homologous end joining in CRISPR related procedures. Although NHEJ is the primary method of DNA repair for most mammalian species, it has been found that HDR is a more dominant method of DNA repair in budding yeasts in a controlled lab scenario. If the scientific community were to somehow identify the biochemical process on why this occurs to only yeast. We may be able to use that information to enhance the CRISPR technology. This is something I did not know about Crispr. I figured that it just silenced the gene sequence and did not take into account the fact that we have response mechanisms for fixing mutations in our genomic sequences. Perhaps this is the reason why we can't use Crispr to silence entire chromosomes because there wouldn't be any progress. It will be interesting to see if they can develop something to block these response mechanisms such as p53.